Fun & Helpful Web Sites! Has your cat turned into a fluffy couch potato? Energetic kittens can quickly become overweight cats if they don't get enough exercise. Luckily, your feline friend can become more active with a little help from you. Regular exercise sessions play an important role in your cat's health. A little exercise not only prevents your pet from gaining weight but also relieves boredom and keeps your furry friend's mind sharp. Exercise sessions don't have to be long. Your pet will benefit from two or three sessions per day that last five to 15 minutes. How Can I Increase My Cat's Activity Level? Fishing Pole. The kitty fishing pole is a classic, inexpensive piece of feline exercise equipment. Your cat will love chasing the dangling "bait" at the end of the fishing line while you swish the rod back and forth. Fishing poles are available at pet supply stores, or you can make your own using a rod or dowel, a securely attached string, and a soft toy or feathers. Fetch. Many cats like a rousing game of fetch just as much as dogs do. Choose an item that your cat can easily fit in his or her mouth, such as a ball or small toy. Chase the Light. Any game that mimics chasing prey, even if the prey is only a dancing light beam, is sure to be popular with your cat. Wave a small flashlight or laser pointer at the wall and watch your cat attempt to catch it the bouncing beam. Walking. Although walking a pet is a little different when a cat is involved, it offers an excellent way for your pet to get a little exercise and enjoy some time outdoors. During your walk, your cat decides where he or she wants to go and you follow. Attach the lead to a harness, not a collar, as pulling on a lead attached to a collar can injure your cat's neck. Choose a safe place for your walk, such as an enclosed backyard. Climbing Towers. Indulge your cat's natural love of climbing with a store-bought or homemade climbing tower. Be sure the tower also includes plenty of cushioned perches for resting. Battery-Operated Toys. Some cats love pouncing on battery-operated birds and mice that make noise and light up. Toys that feature quick movements are more likely to entice your cat. Treat-Dispensing Toys. Balls and other toys that contain compartments for treats increase activity and encourage ingenuity. The toys only dispense the treats when they're positioned precisely, which helps ensure that your pet gets a healthy workout. Although too many treats may cause weight gain, occasional treat-seeking sessions are sure to convince your cat that a little exercise is a good thing. Paper Balls and Boxes. You don't have to spend a lot to encourage your cat to move. A crumpled up paper tossed on the floor can provide hours of fun. Boxes are irresistible for most cats, particularly when you put a toy inside or connect a few boxes together. Agility Training. Agility training isn't just for dogs. In fact, the sport is a featured attraction at cat shows these days. 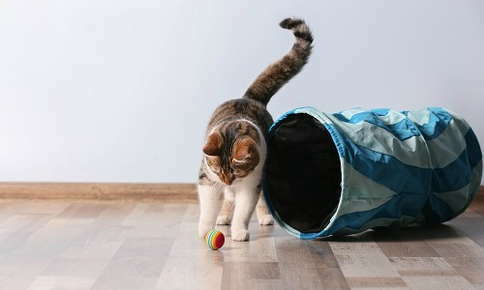 During agility training, your cat runs through tunnels, jumps over hurdles and negotiates obstacles. You can create your own course in your home with boxes and homemade obstacles. Training can be a fun activity for you and your cat, although it will take a while for your pet to master the course. Luring your pet through the course with a fishing rod or other toy is an excellent way to encourage him or her to give the course a try. Are you concerned about your cat's weight, activity level, or health? Call us to schedule an appointment for your pet.